The trip would mark the first time the two leaders met, and the first time Kim would met a world leader since he assumed power in 2011. China announced that North Korean leader Kim Jong Un and his wife, Ri Sol-ju visited the country on Monday, according to the country’s state media. Chinese President Xi Jinping invited Kim for a four-day “unofficial visit” where they discussed North Korea-China relations and watched an art performance. “We speak highly of this visit,” Xi is said to have told Kim. China, North Korea’s closest ally, said Kim congratulated Xi on his reelection as president, and said it was his obligation to applaud him in person. “Both Comrade Chairman and I have personally experienced and witnessed the development of China-DPRK relationship,” Xi reportedly said, using North Korea’s official name, the Democratic People’s Republic of Korea. 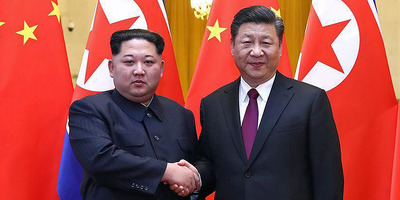 Xi also laid out several proposals concerning the Chinese-North Korean relations: “We are ready to make joint efforts with the DPRK side, conform to the trend of the times, hold high the banner of peace, development, cooperation and mutual benefit, continuously improve the well-being of the two peoples, and make positive contribution to regional peace, stability and development,” he said. The two leaders are said to have discussed North Korean denuclearization – a key concern for the US and South Korea. The two countries are expected to hold their own summit with the North this year. “It is our consistent stand to be committed to denuclearization on the peninsula, in accordance with the will of late President Kim Il Sung and late General Secretary Kim Jong Il,” Kim said, referring to his late grandfather and father, who led North Korea before him. “The issue of denuclearization of the Korean Peninsula can be resolved, if South Korea and the United States respond to our efforts with goodwill, create an atmosphere of peace and stability while taking progressive and synchronous measures for the realisation of peace,” Kim continued. The White House said it was notified of the visit on Tuesday and noted that Xi conveyed a “personal message” to President Donald Trump. Rumours swirled earlier this week that a high-ranking North Korean official had travelled to China, after an armoured train was seen moving through the region. A motorcade of armoured vehicles being led by Chinese police was also spotted, though the passengers could not be identified at the time.